I haven't been able to get out and take pictures the past few days, because I somehow got my sciatic nerve pinched and have been spending most of my time in bed. 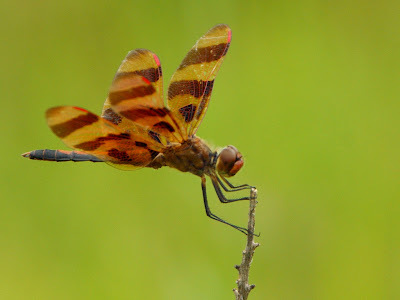 However, before that happened, I was able to capture some photos of a Halloween Pennant back by my pond. Halloween Pennants have a special spot in my heart, because one of my Halloween Pennant photos was my first photo to win an award at the local fair. I couldn't decide if I preferred the vertical crop or the horizontal crop. So, I need your opinion! Which crop do you like? I hope to be up and about so I can take more photos soon! When I was chatting with Tammy the other day, she said she had to pay her car insurance, and I'm so glad she said that, because it reminded me that I had to pay Hub's health insurance! The pain I was in had caused me to forget all other things. Thanks for the reminder, Tam! I like the horizontal crop--beautiful capture! Get better soon, Misty. I like the vertical crop. It gives more perspective to the dragon fly. The horizontal one just seems cut off a little short to me. I do love how perfect he(she?) is in focus too! Can I just say that you continue to amaze me with your photography? You inspire me! I like the vertical crop. It shows how delicate these creatures are to perch on such a slender stalk. I hope you start feeling some relief soon, Misty. I've heard that sciatic pain is very intense. Striking stripey beast. Hope you are on the mend soon. I prefer the horizontal crop. It's a wonderful picture either way. I laugh because we're all giving you different choices so go figure....it's an indiviual thing. I like the vertical best. Hi Misty, so sorry you're not feeling too good right now. Feel better soon. 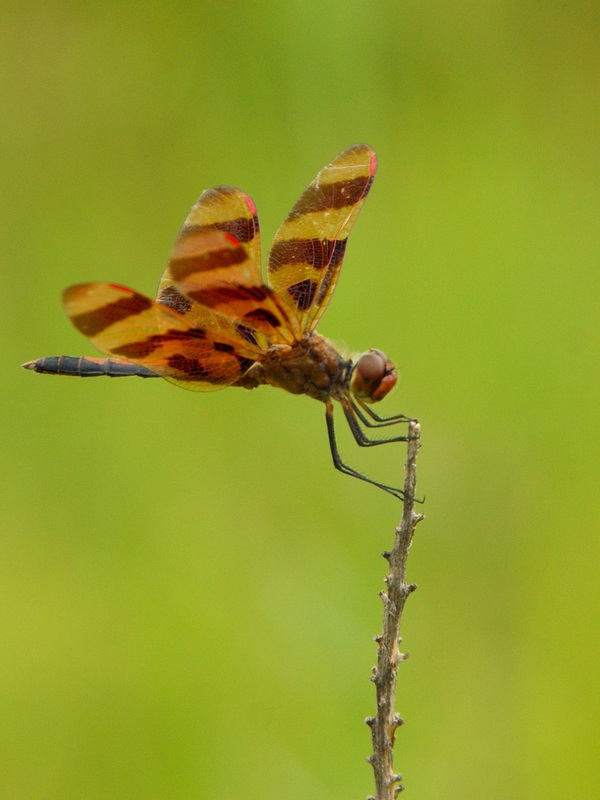 I have never seen a Halloween Pennant before. It's beautiful. A hard choice to choose between the two but I find myself enjoying vertical crops much more these days. I'm back from vacation now and glad to be catching up. Thanks so much for stopping by. Anyway, I do hope you continue to feel better as each day comes along. LETTER TO GOD [written by a DoG] You'll need to scroll down a bit beyond my 3-D movie rant. Both are beautiful. I can't decide which I like best. I find I am using vertical crops much more often than I used to. Exquisite photography! I think both crops work equally well. Beautiful shot, such creamy BOKEH in the background. I definitely like the vertical crop. It's hard to choose but I think I prefer the vertical cropping. Awesome capture! Oh, I love the vertical crop, the first shot, as the insect is perched so precariously on that stalk. Fabulous! I flipped a coin and it came up heads...so I'll go with the crop heads represented. This is so wonderful. I haven't seen this kind of dragonfly before. thanks for sharing. Beautiful dragonfly shot Misty! I don't think I have ever seen one of these. My vote goes for the vertical crop, I like the inclusion of more of its perch. I do hope you get to feeling better soon. 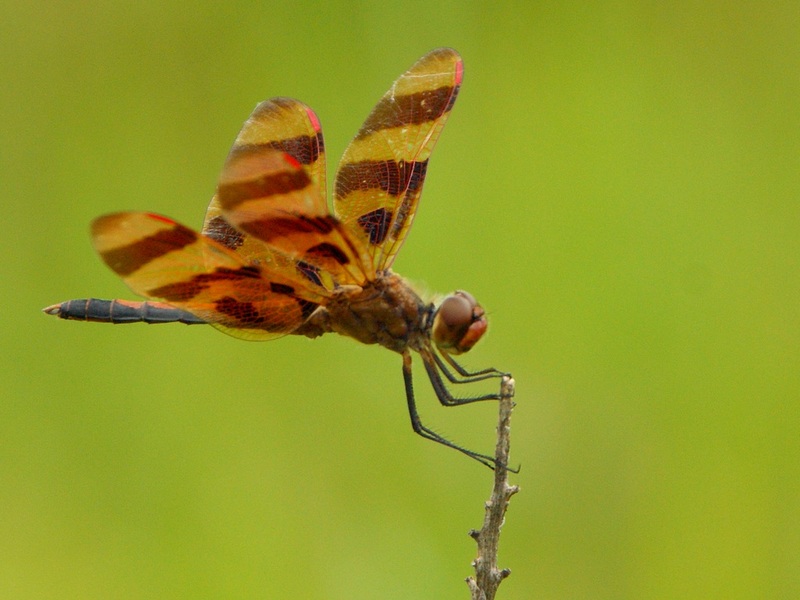 I've never seen this kind of dragonfly before - it's gorgeous! I like both shots but I think I really prefer the balance in the vertical crop the best. Nice work! What a beautiful and unusual critter you've captured here. I like the horizontal crop a little better. Hope your pain is gone by now so you can be up and about.